Hamburg, 14th March 2019. 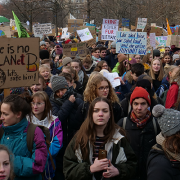 On the eve of the biggest global “Fridays for Future” youth strike for climate, the World Future Council offers its strong support to the dedicated young people holding leaders accountable for their climate commitments. If we are to meet the 1.5°C target of the Paris agreement bold action needs to happen now. “As the ‘Voice of Future Generations’, the World Future Council has been highlighting sustainable solutions in order to keep our planet healthy and ensure a fairer and more just society for present and future generations. Children and young adults have a right to be heard and to be involved in decisions affecting their future, which is exactly what is happening in the ‘Friday for Future’ movement. The climate strikes are a sign of civil engagement, not skipping school. We now have to prove that child rights are more than empty promises”, declares Vandana Shiva, Founding member of the World Future Council and physician from India. 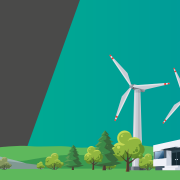 The World Future Council foundation advocates for climate protection, 100 percent renewable energy, ending fossil fuel and nuclear powered energy sources and supporting climate resilient and sustainable agriculture. Furthermore, it campaigns for greater inclusion of environmental and sustainable practice across our education systems. 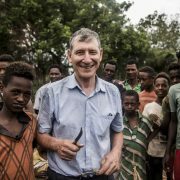 A new handbook on Education for Sustainable Development (ESD) shows how a more holistic, progressive, hands-on education can play a central role in empowering learners of all ages to positively respond to local and global challenges and act in a more peaceful, just, inclusive and sustainable manner. This approach is already helping people develop the skills, values and attitudes necessary to create more resilient societies and transition towards the skilled, green, low-carbon economies of the future. “It’s already past the time we need to act! All the key facts concerning climate change are on the table and international political decisions have been made. Now we have to take action in the name of present and future generations,” urges Alexandra Wandel, Executive Director of the World Future Council. Hamburg, 8 March 2019 – Today’s International Women’s Day is a global day celebrating the social, economic, cultural and political achievements of women. Women world-wide have already changed the world for good, and play a vital role in the transformation to a fairer, just and more sustainable world. The World Future Council is working to pass on a healthy planet and fair societies to our children and grandchildren, and in the light of the global climate crisis especially highlights the accomplishments of their female environmentalists for a living planet. The World Future Council includes female Councillors and Honorary Councillors on all continents who already have made a significant contribution to the protection of our planet working in a wide variety of working areas: Among them are Jane Goodall, primatologist and UN Messenger for Peace, Maude Barlow and Vandana Shiva, environmentalists and recipients of the Alternative Nobel Prize, Thais Corral, Co-Founder Women’s Environment and Development Organisation, Julia Marton-Lefèvre and Marie-Claire Cordonier Segger, representatives of diverse environmental initiatives, Wanjira Mathai, active in the Green Belt Movement, Jan McAlpine, former Director of the UN Forum on Forests, Gertrude Mongella and Hafsat Abiola-Costello, both strongly engaging for women in Africa, Frances Moore Lappé, committed to food, agriculture and democracy policy, Auma Obama, known for her commitment for the rights of children and youth, Anna Oposa, strongly engaging for marine life, Victoria Tauli-Corpuz and Pauline Tangiora, who advocate for the rights of indigenous people. For a list of all Councillors see here. CVs of all Members of the World Future Council can be found here. Hamburg, 26th February 2019 – The World Future Council (WFC) has just released a pioneering new policy handbook, compiling the most exemplary policies and practices to advance Education for Sustainable Development (ESD). 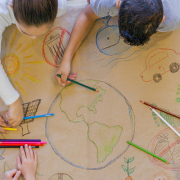 After working with 16 Environment and Education Ministries, the Rights of Children and Youth Commission of the WFC has gathered together evidence that shows ESD can play a central role in empowering learners of all ages to positively respond to the pressing global challenges facing us, such as climate change, biodiversity loss and inequality. This handbook offers insights from around the world on how sustainable education can be implemented successfully in policy, in the curriculum and at the level of schools, universities and other places of learning, to build a better future for all. Countries like Scotland are making an explicit link between ESD and the skills needed to prepare young people for a sustainable economy based on renewable energy and more sustainable consumption and production patterns. Similarly Costa Rica’s policy to decarbonise its economy by 2021 specifically identifies ESD as part of a wider programme for public awareness raising, education and cultural change. 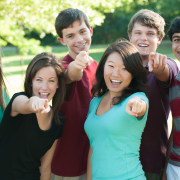 Ultimately, ESD asks us assume active roles in creating a world we’d be proud to pass on to our grandchildren. The World Future Council (WFC) works to pass on a healthy planet and fair societies to our children and grandchildren. To achieve this, we focus on identifying and spreading effective, future-just policy solutions and promote their implementation worldwide. Jakob von Uexkull, the Founder of the Alternative Nobel Prize, launched the World Future Council in 2007. We are an independent, non-profit organisation under German law and finance our activities from donations. Jakob von Uexkull, Founder of the World Future Council, resigns as Chair of the Management Board. Supervisory Board appoints successors. Project topics for 2019 work will be climate protection, child and youth empowerment, agroecology and peace and disarmament. Hamburg, 7th February 2019 – The Supervisory Board of the World Future Council Foundation announced the resignation of Jakob von Uexkull as Chair of the Management Board for health reasons. Von Uexkull founded the World Future Council in 2007 in Hamburg. As he resigns, the Vice Chair of the Management Board Alexandra Wandel (45) as well as Johanna Dillig (35), Head of Operations, were appointed Executive Members of the Management Board. 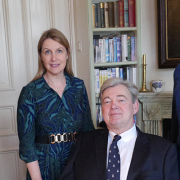 Wandel now acts as spokesperson and Executive Director of the foundation, and Dillig as Director of Operations as well as Vice Chair of the Management Board. The World Future Council (WFC) identifies and spreads the best and most sustainable policy solutions worldwide in order to pass on a healthy planet and just societies to our children. The new board announced that core topics of their work in 2019 will be climate protection and renewable energy, child and youth empowerment, agroecology as well as peace and disarmament. One of the highlights will be the Future Policy Award, which will focus on improving the lives of youth this year. The new Management Board is supported by strong advocates, amongst them Honorary Councillor Prof. Dr. Michael Otto (entrepreneur, Germany) as well as the following Expert Commission Chairs from the Council: Dipal Barua (Founder and Chairman of the Bright Green Energy Foundation, Bangladesh) for Climate and Energy , Helmy Abouleish (CEO, Sekem, Egypt) and Vandana Shiva (Founder, Research Foundation for Science, Technology and Ecology India ) for Agroecology, Dr. Auma Obama (Founder and Director, Sauti Kuu Foundation, Kenya ) for the Rights of Children and Youth and Alyn Ware, Founder and Global Coordinator of the Network Parliamentarians for Nuclear Non-proliferation and Disarmament (PNND), New Zealand/Czech Republic ) for Peace and Disarmament. Abouleish, Barua, Shiva and Ware are also recipients of the Right Livelihood Award (also known as Alternative Nobel Prize). “Innovation happens when people who are facing challenges dare to think outside the box. The practices distinguished as Outstanding Practice in Agroecology 2019 show in an impressive way how holistic and innovative approaches can turn agriculture into a key element to fight not only food scarcity but also poverty, climate change and loss of biodiversity. It’s time to give a stage to these exemplary approaches and think about ways to scale their impact.” say Valerie von Koerber and Samuel Wagner, directors of the start-up Technology for Agroecology in the Global South (TAGS). Hamburg/Katowice, 10 December 2018 – The 24th UN Climate Conference (COP24) is underway in Katowice, Poland (2-14 December). After countless unusual weather events have wreaked havoc all over the globe this year, this round of climate change negotiations comes at a critical time. Implementing far-reaching changes to our societies to cut carbon and phase-out fossil fuels has become inevitable. Against this backdrop, the Global Renewables Congress (GRC) will be launched on December 11 on the sidelines of COP24. The GRC is a new cross-country, cross-party platform for ongoing dialogue between and with legislators for the rapid and large-scale deployment of renewable energy solutions. Current and former legislators from national and regional parliaments can become members of the GRC. The GRC is chaired by Bärbel Höhn, former MP of the German Bundestag and acting Commissioner for Energy Reform in Africa for the Federal Ministry of Economic Cooperation and Development. Co-Chairs are appointed representing each of the major regions of the world. The World Future Council provides the secretariat of the GRC. The GRC is made possible through the support of the German Federal Environmental Foundation (Deutsche Bundesstiftung Umwelt/DBU) and the Stiftung Mercator. Additional support for this project was made available by Mr. Amir Roughani, Ambassador for the World Future Council. 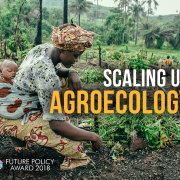 Hamburg/Rome, 12 October 2018 – The world’s best laws and policies promoting agroecology are awarded the Future Policy Award (FPA) 2018. The “100% organic state” Sikkim, in India, is this year’s winner of the “Oscar for best policies”, beating 51 nominated policies from 25 countries. Policies from Brazil, Denmark and Quito (Ecuador) take home Silver Awards. This year’s award is co-organised by the Food and Agriculture Organization of the United Nations (FAO), the World Future Council (WFC) and IFOAM – Organics International. Gold Prize winner Sikkim is the first organic state in the world. All of its farmland is certified organic. At the same time, Sikkim’s approach reaches beyond organic production and has proven truly transformational for the state and its citizens. Embedded in its design are socioeconomic aspects such as consumption and market expansion, cultural aspects as well as health, education, rural development and sustainable tourism. The policy implemented a phase out of chemical fertilisers and pesticides, and achieved a total ban on sale and use of chemical pesticides in the state. The transition has benefitted more than 66 000 farming families. The Sikkim tourism sector has benefitted greatly from the state’s transition to 100 percent organic: the number of tourists increased by over 50 percent between 2014 and 2017. As such, Sikkim sets an excellent example of how other Indian states and countries worldwide can successfully upscale agroecology. Brazil’s National Policy for Agroecology and Organic Production (PNAPO, 2012): In its first cycle of activities PNAPO invested 364 million Euros. Amongst others, it helped 5,300 municipalities to invest 30% or more of their school feeding budgets in organic and agroecological products purchased from family farmers. Denmark’s Organic Action Plan (2011-2020, updated in 2015): As a result of the Action Plan, Denmark has the highest market share of organic products in the world, with almost 80 percent of Danes purchasing organic food. Quito’s Participatory Urban Agriculture Programme (AGRUPAR, 2002): With over 3 600 urban gardens growing on 32 hectares and more than 21 000 people trained, AGRUPAR fosters food security, increases incomes, and enhances ecosystem functions. The Vision Award goes to TEEBAgriFood, an initiative of “The Economics of Ecosystems and Biodiversity” (TEEB) by UN Environment. TEEBAgriFood has developed a comprehensive evaluation framework for food systems that helps decision-makers to compare different policies and the market to value food more accurately. The three Honourable Mentions of the Future Policy Award, this year go to the Good Food Purchasing Policy of Los Angeles, USA (2012), to the Agriculture Development Programme of Ndiob, Senegal (2017) and to the From Arms to Farms Programme of Kauswagan, the Philippines (2011). 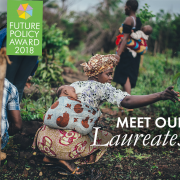 The Future Policy Award 2018 is co-organised by the World Future Council, FAO and IFOAM – Organics International, with the support of Green Cross International, DO-IT – Dutch Organic International Trade, Sekem Group, Egypt and EcorNaturaSi, Italy. “By scaling up agroecology, it is possible to tackle malnutrition, social injustice, climate change, and loss of biodiversity. Through effective, holistic policymaking, we can transform our food systems so that they respect people and planet. The 2018 Future Policy Award winners prove that it is feasible – and how. 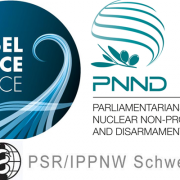 Policymakers across the globe should follow their example and step up similar exemplary political action!” says Alexandra Wandel, Director of the World Future Council. Developed as a result of intense civil society engagement and structured around seven comprehensive guidelines that encompass the most relevant aspects of sustainable food chains and systems, Brazil’s National Policy for Agroecology and Organic Production is a unique federal framework policy for the promotion of agroecology and organic production in Brazil. In its first cycle of activities it led to impressive quantitative results in terms of advancing the agroecological agenda in the country (budget and initiative-wise), investing over EUR 364 million, resulting in visible large-scale improvements for smallholders and vulnerable groups in Brazil. Amongst others, it constructed 143,000 cisterns; assisted 5,300 municipalities to spend 30 per cent or more of their school meal programme budget on purchases of organic and agroecological products from family farmers; assisted 393 rural family farming organizations; launched several public calls that enabled agroecological organizations to expand their staff on an unprecedented scale benefitting about 132,744 farming families; trained 7,722 technicians and 52,779 farmers; promoted 24 networks for agroecology; trained 960 professionals and political leaders on financing women in organic and agroecological agriculture, which benefitted 5,200 rural women in 20 different Brazilian States; financed nine projects for seeds for agroecology; and much more. Developed by involving a broad spectrum of stakeholders, Denmark’s Organic Action Plan (OAP) supports diversified agroecological farming and a holistic strategy to build long-term fertility, healthy agro-ecosystems and secure livelihoods, by increasing, on the one hand, the overall demand for organic agricultural products in Denmark and abroad, and hence stimulating farmers’ motivation to convert from conventional to organic food production, and on the other hand stimulating research and product innovation. The OAP is supported by substantial dedicated funding, has invested so far around EUR 192 million (2015 to 2018) and produced very clear positive outcomes: Today Denmark has the highest market share for organic food among all EU countries and the highest annual per capita spending on organic food. Amongst others, the OAP motivated municipalities through a national goal to achieve 60 per cent organic in all public kitchens, by earmarking funds to support the conversion process and primarily through the education of kitchen leaders and workers, and changes in supply chains and menus; thereby, for instance, the city of Copenhagen succeeded in developing one of the most ambitious public procurement programmes in Europe, which met the goal of 90 per cent organic food in 2015, without an increase in meal prices. Launched in the aftermath of a deep economic crisis and set up on the basis of a broad, largely women-led community consultation, Quito’s Participatory Urban Agriculture Programme promotes the production, processing, marketing and distribution of healthy organic food from urban and peri-urban gardens in the Metropolitan District of Quito. 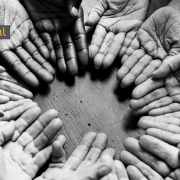 In its 16 years of existence, AGRUPAR has continuously expanded and considerably advanced food security, job creation, income generation, environmental management, gender equity, social inclusion of vulnerable groups such as women, elderly and migrants, and micro-entrepreneurship. Among AGRUPAR’s impressive results are: 4,500 participants that now produce more than 870,000 kg of food products per year for the city; more than 3,600 urban gardens that cover 32 hectares in total; more than 21,000 people – 84 per cent of whom are women – trained in organic production; more than 6,600 bio-fairs attended by about 170,000 consumers that have been organized so far; more than 170 micro-enterprises that created more than 330 jobs with an average income of USD 3,100; and much more. Political commitment to support organic farming in Sikkim began in 2003 and was consolidated in 2010 with the design of the Sikkim Organic Mission, a road map that clearly detailed all the measures necessary to achieve the target of becoming a fully organic state by 2015 – the first such far-sighted and visionary policy commitment by a state in India or indeed the world. By setting the 100% organic goal and implementing this political strategy, Sikkim reveals itself as a ground-breaking policy that takes all necessary measures to reverse the prevailing economic logic, which favours forms of food production failing to preserve the biodiversity and ecosystem functions agriculture depends on. This action plan, together with its linked policies, is unique in its boldness and notable for the holistic approach adopted, tackling many aspects needed for the transition towards organic farming (input provision, capacity building, etc.) in combination with mandatory requirements, such as gradually banning chemical fertilizers and pesticides, with support and incentives, thus providing sustainable alternatives. As a result, in December 2015 Sikkim became the first organic state in the world with more than 66,000 farming families practicing organic farming state-wide, managing 75,000 ha organic certified, and tourism augmented considerably: between 2012 and 2016 the number of Indian tourists increased by 40 per cent, meaning more than 800,000 people per year, while the number of foreign visitors doubled. Having experienced over three decades of Moro conflict, Kauswagan in the Philippines witnessed and suffered from the atrocities of war until 2010, when the local government introduced an outstanding policy that shows how conflict resolution can be achieved by tackling food security – the programme ‘From Arms to Farms: Walking through the Paths of Peace’ that addressed the root causes of the conflict, which were poverty, food insecurity and inequalities between population groups, notably Muslims and Christians. Based on a broad participation of different actors, led by the Local Government Units and other support groups, the programme proved very successful by helping over 600 former combatants to reintegrate into society through farming and thanks to strong leadership and well-conceived governance, Kauswagan turned from a territory disrupted by decades of war into a platform for innovation and sustainable agricultural development. As a result of this exemplary programme, no incidents of crime related to armed conflict between Muslims and Christians have been registered in the last four years in the area; the rate of poverty in the area decreased to 40 per cent in 2016, thus meeting the programme’s target in just five years; food production increased thanks to the fact that 300 ha of previously abandoned land are now cultivated by ex-fighters under organic and agroecological practices; and communities have been positively affected because they can send their children to school. Thanks to a very engaged Mayor and Municipal Council as well as local community, Ndiob became the first city in Senegal to embark on an agroecological transition. Designed in a large community consultation, citizens from 18 Ndiob’s villages formulated their Agriculture Development Programme, which includes five priorities: food security, management of natural resources, soil fertility, livestock breeding and farming, and agriculture. Investing a notable 23 per cent of its total budget into developing agroecology, Ndiob has undertaken a series of appropriate and adequate measures to sustainably manage its natural resources and to achieve food security, including: training 600 producers and strengthening their skills in good agricultural practices; achieving self-sufficiency in certified millet seeds (about 10 tonnes); planting 300 ha of millet in ecological agriculture (producing about 450 tonnes) to ensure food self-sufficiency to 300 families; generating 84 tonnes of peanut seeds, which resulted in each of the breeders gaining more than EUR 530 of income in just the2017 season; training 15 women group leaders on cereal processing techniques and the preparation of local, high quality cereal-based dishes; establishing an expanded public commission to ensure good land management, a farmers’ cooperative, a storage warehouse and a credit fund for financing agricultural and processing projects for young people and women; and much more. The TEEBAgriFood is a path-breaking, globally applicable food systems evaluation framework, which for the first time presents all wider benefits and costs associated with all relevant dimensions (environmental, health, social, cultural) of the eco-agri-food value chain in one single report. By evaluating the significant external costs and benefits inherent in different food systems, and making these costs transparent, decision-makers on farms, and in governments, institutions and businesses can make better-informed decisions that take into account the impacts of the available choices. This holistic approach of ‘true cost accounting’ allows the recognition, valuing and managing of the positive and negative externalities of all human behaviour and will lead to more agroecological and equitable food systems. The TEEBAgriFood Evaluation Framework will soon be applied at the country level across Africa and in Brazil, China, India and Mexico.